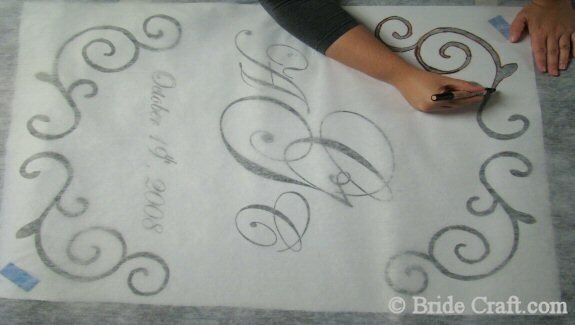 Create a Custom Wedding Aisle Runner! 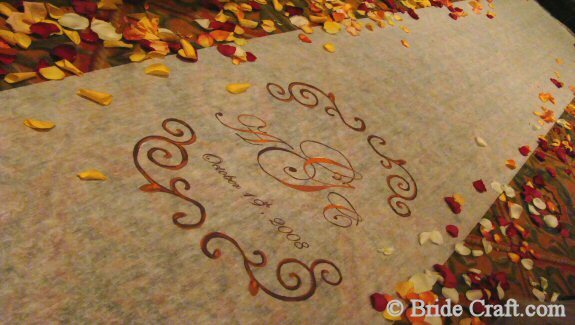 Love the idea of a custom wedding aisle runner? Hoping to include an aisle runner monnogram? But the high price of a professional custom wedding aisle runner send you running? Then this project is for you! 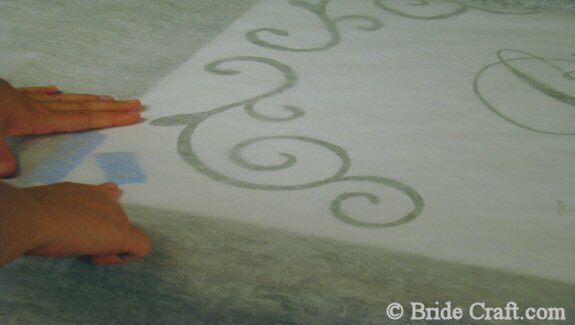 Below you will find a step by step tutorial showing you how to include an aisle runner monogram to create your own custom aisle runner at a fraction of the price. Pros: Not expensive at all! You can choose any design, add designs on the sides, make it as large or small as the runner itself will fit, etc. And this project can be done months and months in advance. Cons: Very few cons in my opinion. 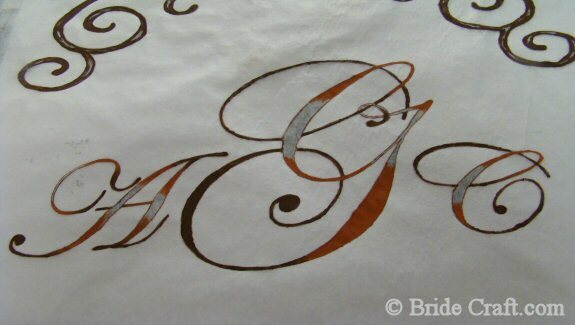 If you’re not careful, and you lay the first layer of paint on too thick, it may stick to the paper underneath. In which case you need to use surgical precision to separate the runner and paper, or else you risk tearing a hole in your runner and ruining your hard work. 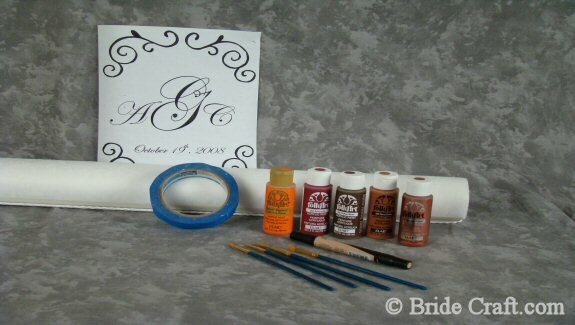 Step 1: You will need a standard aisle runner (made of a paper thin, poly/fabric like material), acrylic craft paints, an assortment of craft paint brushes, painter’s tape, a marker that matches the majority of your color scheme and a printed version of whatever monogram you would like on your runner and wax paper, which is not shown here. Note: This project may also include a trip to your local copy shop. Step 2: We used a local copy shop to enlarge our 8.5 X 11monnogram print to a size that was appropriate for the runner width. 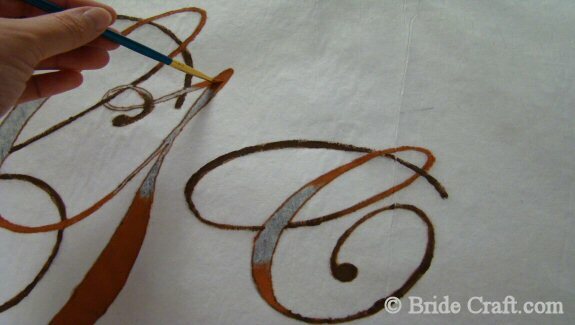 Unroll the runner and find the place that you would like the design to appear. Proceed to use the painters tape to secure the enlarged design to the underside of the runner. 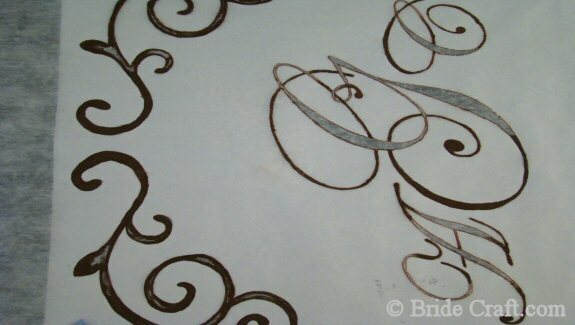 Step 3: Using your marker, begin tracing a neat outline of your aisle runner monogram. Tip: After tracing the design on, you may wish to remove the paper from underneath and replace it with sheets of wax paper so that the paint doesn’t seal the paper and the runner together. If this does happen, be extremely cautious when separating the two. 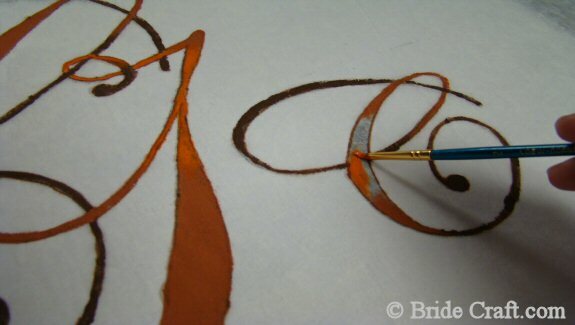 Step 4: Using the darkest paint, create a thick border around all of the inner edges. Step 5: Note how only the edges of the font are painted in with the darker color. Make sure that your font is sharply painted. 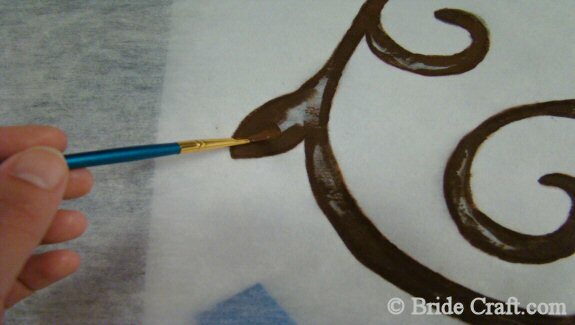 Step 6: Begin adding the next lightest color into the font and any surrounding border. Leave room for the brightest color. Step 8: In the same manner as the previous steps, add in the brightest color. Also add it into the border design. Any other accents can be done at this time. 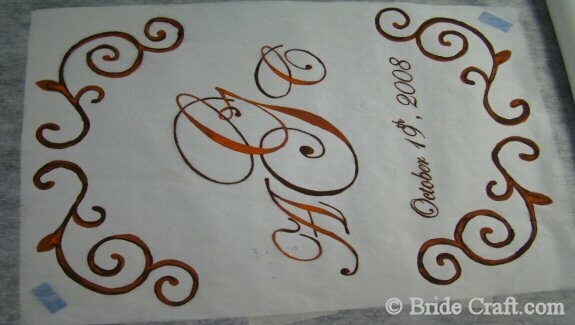 Step 9: Your custom wedding aisle runner, depending on it’s design, should look something like this. Enjoy your stroll down the aisle in style!